Do you have a little fashionista between the ages of 6 months to 7 years old? She could be one of the next faces of Smboutique! We are conducting a model casting call for girls ages 6M-7Y to be a part of our shoot in the Houston area only. 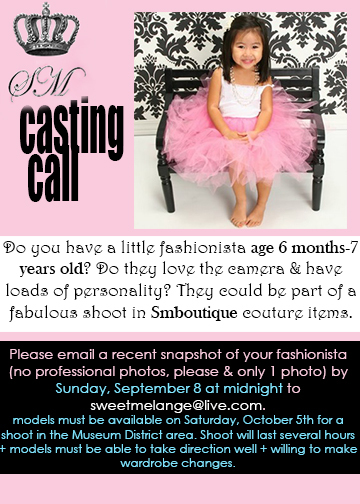 -Email us 1 non-professional snapshot of your daughter (ages 6M-7Y) to sweetmelange@live.com by Sunday, September 8th at midnight. -Please title your email with subject: CASTING CALL and be sure to include her age along with clothing size in email. -Models MUST be available on Saturday, October 5th in the Museum District area. The shoot will last several hours and models must be able to take direction well. One parent/guardian must be on hand. – Besides feeling like models for a day and being featured on our website. Your child will also score the following: 1 FREE professional digital file of your child and a goodie bag for the models. This entry was posted in Uncategorized and tagged baby boutique, boutique store, casting, casting call, children boutique, model, online boutique, photography, pictures. Bookmark the permalink.